Virgin Mobile is doing its part to reduce high cell phone bills by offering ad-supported cell phone plans. 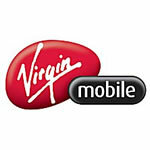 Virgin Mobile users will earn free calls if they view and respond to video ads on their phones. The question, of course, is just how much ad crap will a person put up with before they just say "screw it. I just want to make a F'ing phone call!"? Axe is at it again. This time they've launched Booty Tones, ring tones that are matched to 15 hotties, each of which is noted in a black book. It's always a good thing if a girl causes you to write, as on did here, "Can't belive I was able to get out of bed this morning." Check them all out here from the Demanding Diva to the Head Case to The Tease to the Ball n' Chain to the Eager to Please and more. - WE is promoting the upcoming season of Bridezillas with a character blog featuring various polls, wedding tips, quizzes, wallpapers and all that crap. - Virgin Mobile wants you to adopt a mime. - A new study from word of mouth agency BoldMouth and research firm Osterman Research surveyed marketers on their word of mouth and buzz marketing practices. It's new, it's hard to measure but it seems to work. - CoBRANDiT has a new video culled from those who attended the recent Portfolio Night IV. - Bluelithium's release of its new AdPath 2.0 behavioral targeting product has provided advertisers with 200 - 300 percent increases in click-through rates. Working with Saatchi & Saatchi, Toyota will sponsor a spin-off of the FOX series Prison Break called Prison Break: Proof of Innocence which will be broadcast to mobile phones and supported with ten seconf pre-roll ads. The mobile series itself will be promoted on the TV series with two minute spots airing in May as the first year of the show comes to a close. The effort is, of course, to reach the hard-to reach-younger demo and leverage the booming use of the cell phone as the central media device for consuming content. The Wall Street Journal writes, "'Prison Break: Proof of Innocence' wasn't written by the same people who work on the regular series, and the mobisodes won't feature actors from the show, although the original producers have veto power over anything. The series introduces the character of Amber McCall and follows her path to exonerate her friend L.J., who has disappeared after being framed for murder. In the regular series, L.J. is the son of one of the lead characters. Amber will be played by actress Mandell Maughan; Fox says this is her first professional acting credit." 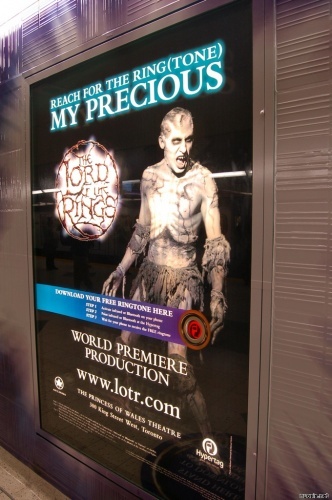 While riding the subway to work in Toronto, Jonathan Hung noticed a poster promoting the Lord of the Rings musical (who knew?) at the Prince of Wales theater. What caught Hung's attention was the poster's encouragement to fire up the bluetooth or infra-red on his phone, point it at the poster and get a free ring Lord of the Rings-themed ring tone. While Hung says the musical isn't supposed to be very goo but the ad is a lot better than all the "take one to learn how to speak any language" ads that seem to be everywhere. Tulsa area McDonald's have teamed with mobile marketing company Gamut Industries to create Mobile Whoa, a campaign that offers people an SMS scavenger hunt, mobile coupons and a mobile phone picture gallery. People can join the hunt by texting "hunt 62931" or at the website. Clues will be sent until the mystery is solved. The coupons, dubbed "mCoup," are available beginning April 17 and will provide a free small order of fries or hash browns. Damn, I'm in! The mobile phone picture directory will offer ring tones and wallpapers to those who upload photos. 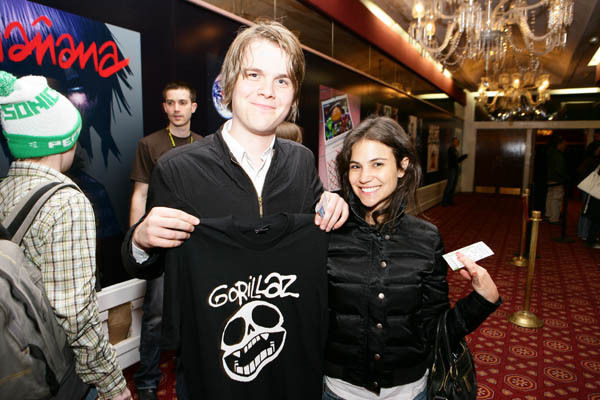 Since we're only "almost-sorta-cool," we have no idea what Gorillaz Demon Days Live is (Ed. Silly, it's a game/music/tour thingy) but we do know Motorola is sponsoring it and is offering "Motoglyphs" (wallpaper for your mobile), games, images, videos and other cool stuff for people who know what the hell this is. Oh, look at the URL...it's out friends over at NightAgency. Who knew? 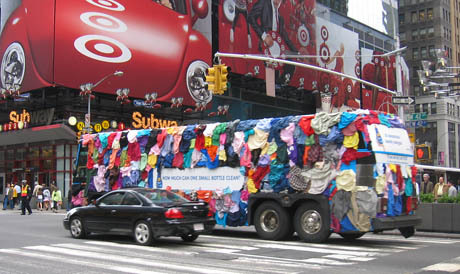 To demonstrate its video offerings for Amp'd mobile phones, Klipmart created an ad banner that contains six panels of streaming video with the ad unit. The goal was to demonstrate the capabilities of the Amp's site within the banner. Within the ad unit, users can click on any of the videos to view them on a larger screen with sound and music. The ad first presents a 3-D tour of various Amp'd models with "Amp'd Live" as a menu option. Clicking on "Amp'd Live" presents the six streaming video panels. Ads will appear on Buy.com. Yahoo, Fox Sports, CNET, Maxim and others. See the ad unit here. 88Slide is a short, daily video a trivia challenge that poses multiple choice question which are answered in the next day's video. Winners receive various gift certificates as prizes. 88Slide, hosted by Rachel, can be subscribed to through iTunes or received daily via cell phone. There's also a blog, an RSS feed and humorous outtakes.